A former disciple of The Cult of Rao named Tanya escapes from what remains of the fanatical group, with a journal that may hold the key to freeing Sam from Reign's influence.As Kara and Mon-El start to investigate the cult, James tries to protect Tanya, only to have his identity as The Guardian exposed. Meanwhile, Alex and J'onn try to get Ruby and M'yrnn out of their respective shells with a day out. Kara's hypocrisy about being upset that James would chose to not lie to his girlfriend over indulging her paranoia is horribly out of character. Her justification that she's protecting Lena by denying her that knowledge doesn't hold water either, given how Lena is already at risk as the outspoken leader of a major company and scion of a family of famous criminals. Mon-El somehow manages to top this with his line (which Chris Wood doesn't sound like he believes either) about how lying to Lena is noble because it is meant to protect her. It defies all the laws of ballistics for Olivia to shoot The Guardian in the face and to have his helmet just open up and bounce off his head in the manner we see. James' justification for revealing himself to the world is nearly as nonsensical as Kara's reason for hiding who she is from Lena. Granting that representation is important, James would be put in a lot more danger by revealing his secret identity than Kara would. And the idea that Kara is somehow protecting her friends doesn't really wash given that all her friends are, with the exception of James and Lena, government agents who are continually risking their lives and at risk from their association with Supergirl anyway. While the Guardian subplot of this episode feels entirely tacked-on and far too preachy, Mehcad Brooks still does a fantastic job delivering his speeches. While it's totally unbelievable that Ruby just accepts M'yrnn's talk about what Mars is like with no cynicism at all, Carl Lumbly does a fantastic job with the dialogue. The two books on child psychology that Alex is reading in an effort to relate to Ruby are Kids & Trauma by Emmet Falconer and Coping With Emotional Childhood Trauma by Agnes Debinska. These are not real books, but they are clever nods to two members of the Supergirl production team. Emmet Falconer is a boom microphone operator on both Supergirl. Agnes Debinska is a set designer on Supergirl. Lena's latest plan to cure Sam utilizes a biolistic delivery system, usually used for overwriting genes in crops. Kryptonian cels are closer to plant cells than one might think, due to how they process sunlight. Lena's process takes particles of heavy metals, coats them in DNA, and then uses that to overwrite the Reign DNA with Sam's. It doesn't work, but Lena insists it should with the right metals and the right vectors. The cell Lena put Reign in has a refractive scatter field. This prevents anyone from seeing into the cell or being able to see out of it, even with X-Ray vision. The wavelength interference of the force-field hurts any Kryptonian who looks at it. The ashes and wall-markings Mon-El finds in the Cult of Rao hide-out resemble the remains of a body caught in a nuclear bomb. As Kara notes, there is nothing on Earth that could destroy a body in that manner without also destroying the building around it. Tanya's father and brothers were all shot by the police. J'onn says that the brain of a Martian wearing a psychic inhibitor is basically identical to that of an ordinary human. J'onn says he read about a study which said that playing three-dimensional video games can reverse the decline of dementia. As M'yrnn points out, the word Arcade originally referred to a series of arches carried by columns or piers, a passageway between arches and a solid wall, or a covered walkway that provides access to adjacent shops in Ancient Rome. The woman whose ashes Mon-El found was not killed by a nuclear bomb. After Lena identifies the reside, she determines that it was generated by a heavy metal reaction. The heavy metal in question is not one found on Earth. Kara recognizes the formula for the otherworldly metal from Coville's Journal. It is the chemical composition for the stone used to make The Rock of Yuda Kal. Kara guesses that The Cult of Rao was using The Rock of Yuda Kal to make a new Worldkiller. The Cult of Rao van has some kind of scrambler on it that keeps it from being tracked by The DEO. The recipe for making a Worldkilelr includes one oronc of Sedenach dust and seven lak-mar of nitrogen. Mon-El is able to generate a frequency only Kara can hear using a Kryptonian Sunstone. The Rock of Yuda Kal was drained of all its power. Luckily, Lena and Winn copied its charged radiation signature and found a sample of the same rock five light years away from Earth. Reign's Pestilence powers act like an anti-virus scanner to Kryptonite, slowly allowing Reign to develop an immunity to it. Supergirl: I don't - I don't like this tension between us, Lena. And I know it's my fault. I know James told you what I asked him to do and... look, I feel terrible about it. I made a huge mistake. And I'm sorry. Lena: (cooly) Well, it's easy to admit your mistake when you've been exposed. Supergirl: (quietly, taken aback) That's fair. (pauses) I just don't want one mistake to ruin our friendship, that's all. Supergirl: (smiling in relief) Good. Lena: We don't have a friendship, Supergirl. Lena: All this time we've been working together, it's been about work. We have a mission to complete. And I'm not about to let any tension between you and I get in the way of that. Are you? Supergirl: I - I - I just hope, um, when we solve this, we can work to rebuild our trust. Lena: Why is it so important to you that we're friends? I have friends, Supergirl. Friends that don't scheme behind my back or lie. Given my family history, they know how painful that would be. They also know I would never enter into a friendship with anyone who's already breached that trust. Cultist: We'll deal with you after the ceremony's done. Mon-El: Do you, by chance, know where I can find the Rock of Yuda Kal? Kara: I'm supposed to stand for Truth! How am I supposed to be truthful? Really truthful? Mon-El: Well, if you tell Lena the truth, you'd be doing it to make yourself feel better, not her. So maybe, in this case, it's uh...not telling her the truth that is the noble thing. It's a sacrifice you're making to protect her. Kara refers to what Lillian Luthor said in 221 about how Lena would never forgive Kara for lying to her if she ever found out Kara was Supergirl. Tanya, a former member of the Cult of Rao, steals Thomas Coville's journal, and takes it to James Olsen. She says that she thinks The Cult is using it to build another bomb, like in 304. Tanya was a linguistics and semiotics teacher, who helped Thomas Coville to learn Kryptonian. She was the only person who knew how to read Kryptonian besides him in The Cult of Rao. Tanya says that Thomas Coville just disappeared and it was believed that he died serving Reign. Coville was last seen in The Fortress of Sanctuary in 312. In his last communication with The Cult of Rao, Thomas Coville said that they had been worshipping the wrong god and that Reign, not Supergirl, would be their salvation. Alex buys a 1962 Item - a vintage bike she always wanted. Sam is allergic to cats. Mon-El finds evidence of The Cult of Rao building an advanced nuclear weapon that destroys bodies but leaves inanimate objects intact. Olivia - one of the cultists from 304 - is seen again as she leads the raid on CatCo to recapture Tanya. She apparently took over the cult after Thomas Coville disappeared. 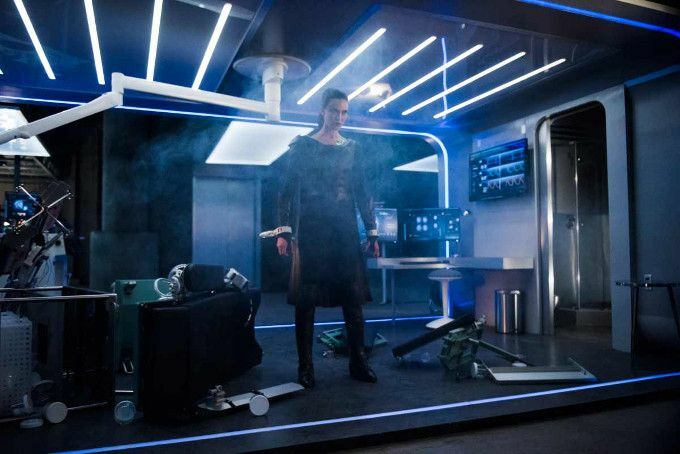 James had Cat Grant's private elevator altered to hide a storage space for his Guardian armor. James's face is revealed when The Cult of Rao break his helmet and the police show up. Tanya recognizes the jewelry Mon-El found in the ashes as belonging to a woman named Liza who was her friend. M'yrnn has a PTSD panic attack watching a video game that involves shooting aliens. The Rock of Yuda Kal is a statue of the ancient Kryptonian goddess of life, which Coville found in Addis Ababa. James says he was seven years old the first time he was put in handcuffs. He and his cousins were arrested at a resort while playing hide and seek. James was the youngest at 7. The oldest cousin was 11. There are no cork trees on Mars. Mon-El goes with Tanya when she turns herself into The Cult Of Rao, pretending to be some random guy who thought their van was an ride-share vehicle. One of the ingredients to make a Worldkiller is Sedenach dust. The planet Sedenach was mentioned in 209 as home of The Bismuth Mountains - a place of great beauty with natural crystal staircases. Olivia transforms herself into a new Worldkiller. When Supergirl touches The Rock of Yuda Kal, it causes her to lose control of her powers, as her heat vision turns on and she cannot shut it off. Mon-El is able to handle it just fine. Supergirl is able to remove The Rock of Yudal Kal from Olivia's hand with a focused heat vision blast. James tells Kara that he intends to reveal his identity as The Guardian to the world someday, on his terms. Ruby dyes her hair with blue tips. Reign is becoming immune to Kryponite. Lena guesses that she can only keep her contained for a few more days at most. Mon-El tells J'onn that he wants to admit that he still has feelings for Kara, but that telling her will only serve to make him feel better. J'onn agrees it is best to keep it quiet. Kara and Mon-El borrow J'onn's spaceship to retrieve the charged Rock of Yuda Kal. The end of the episode reveals that Thomas Coville is still alive, as he arrives at the site of the ritual to turn Olivia into a Worldkiller. Why can't Kara reveal her secret identity to Lena? Well, because that would solve all her problems immediately. And her justification that confessing the truth now would cause Lena to abandon her completely does not excuse the original lie. A series of poorly written scenes are saved by some fantastic acting. I know it's a running gag about how the heroes of The Arrowverse never seem to remember the lessons about how much trouble keeping secrets from the team causes in the long run, but it is taken to truly ludicrous extremes in this episode as everyone justifies everyone else's lies with some incredibly flimsy logic. The most vexing thing is that every moment of this episode feels like filler, even the bits that nominally tie into the main plot! The revelation that more Worldkillers can be made is never treated with the gravity it deserves and the grand irony is that the best performances involve the least necessary parts of the story (i.e. Carl Lumby's speech about Mars, James' talk about how rough is is for black superheroes, etc.). The main problem in all of this is that James' story as Guardian has been so deeply buried by the events of Season 3 and the Cult of Rao hasn't been referred to in so long that there's no sense of urgency like there is with Ruby's life being threatened and Sam slowly becoming more and more like Reign. At least Kara finally realized the hypocrisy of her refusal to share her secret identity with Lena but it's likely too late to do anything but be another source of drama as we wait for the day Lena inevitably goes "full Luthor" in response to Kara's betrayal of her trust.